Before I move on from the children and grandchildren and other descendants of my great-great-grandparents Jacob and Sarah Cohen, I need to go back and fill in a few gaps. When I wrote about their first two children Fannie and Joseph, I did not research the children of those two family members completely. I figured I would go through the lifespan of each of the children of Jacob and Sarah and pick up what happened to their grandchildren at some later point. As I moved on to Fannie and Joseph’s siblings, however, I changed my approach and traced the children and even the grandchildren as far forward as I could. Now I need to go back to Fannie’s children and Joseph’s children to complete my research and my recording of their stories. First, Fannie. 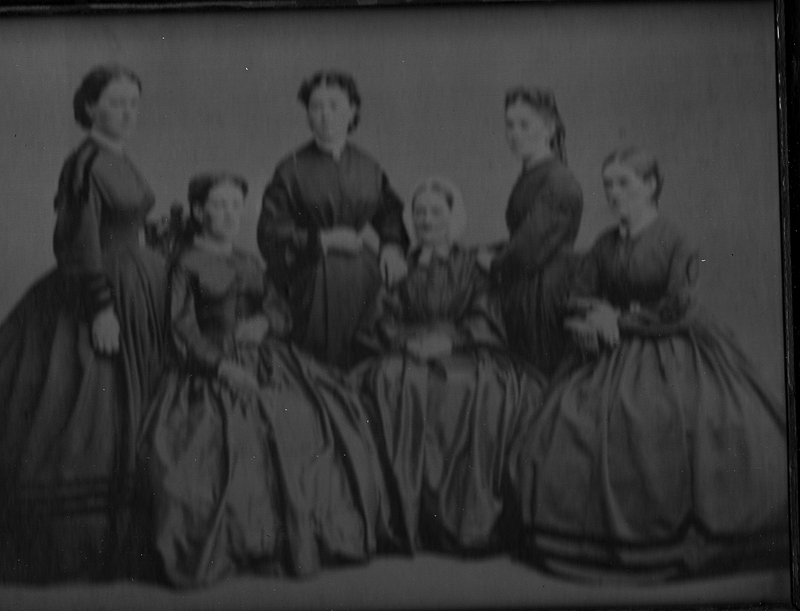 Fannie or Frances and her husband Ansel Hamberg had five daughters. One, Rachel, had died of typhoid fever as a toddler, as I previously reported. The others all lived to adulthood. The oldest, Sarah or Sallie, married Harry Speare and moved to Atlantic City. As far as I can tell, they did not have any children. 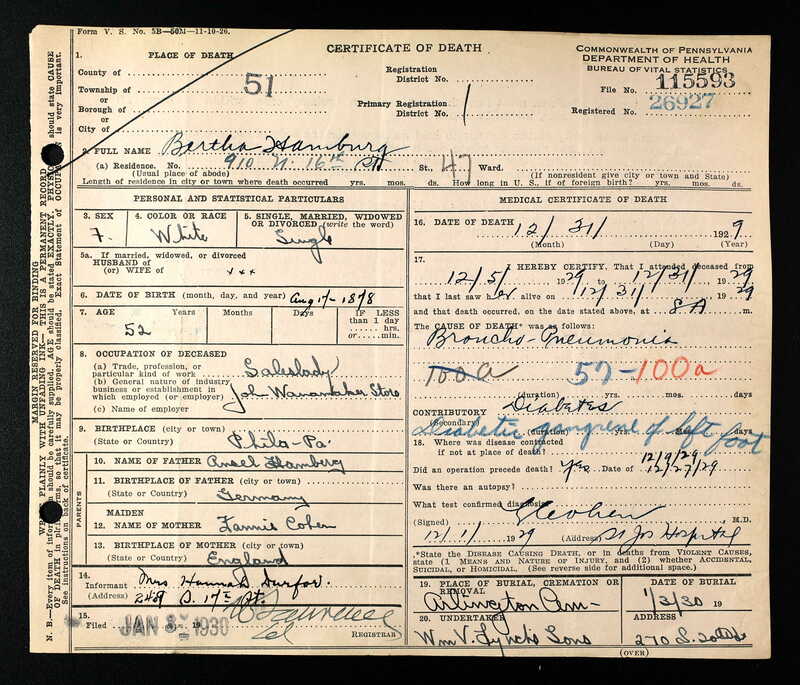 Sarah died March 7, 1918, when she was 51 years old, according to her death certificate. She was buried with her parents at Mt Sinai Cemetery in Philadelphia. Her husband Harry lived to be 98 years old and died in 1970; he is buried with Sallie at Mt Sinai. The next sister, Hannah, married Walter Durfor in 1907. Walter was a meat inspector for the government in 1910, and they were living in Philadelphia with Walter’s brother, Howard, who was a chemical engineer. Hannah and Walter also seem not to have had children as there are none appearing on either the 1910 or the 1930 census. (I have not yet found them on the 1920 census.) Walter continued to work as a meat inspector. Hannah died from heart disease and kidney disease on December 12, 1935. She was 64 years old. Walter died on January 8, 1951. They are buried at Fernwood Cemetery outside Philadelphia. Bertha Hamberg never married or had children. 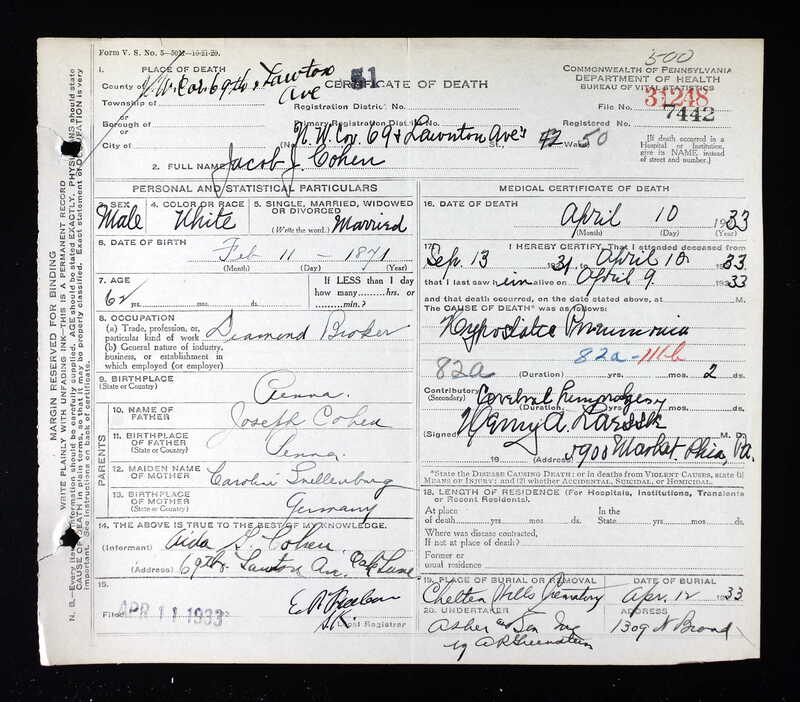 She was living with her mother up through the 1910 census at least, and in 1920 she was a boarder, living in what appears to be a rooming house and working as a saleswoman in a department store (John Wanamaker’s, according to her death certificate). Bertha died just nine years later on December 31, 1929, from broncho-pneumonia. She also suffered from diabetes, which had caused her left foot to develop gangrene. She was only 52 years old. 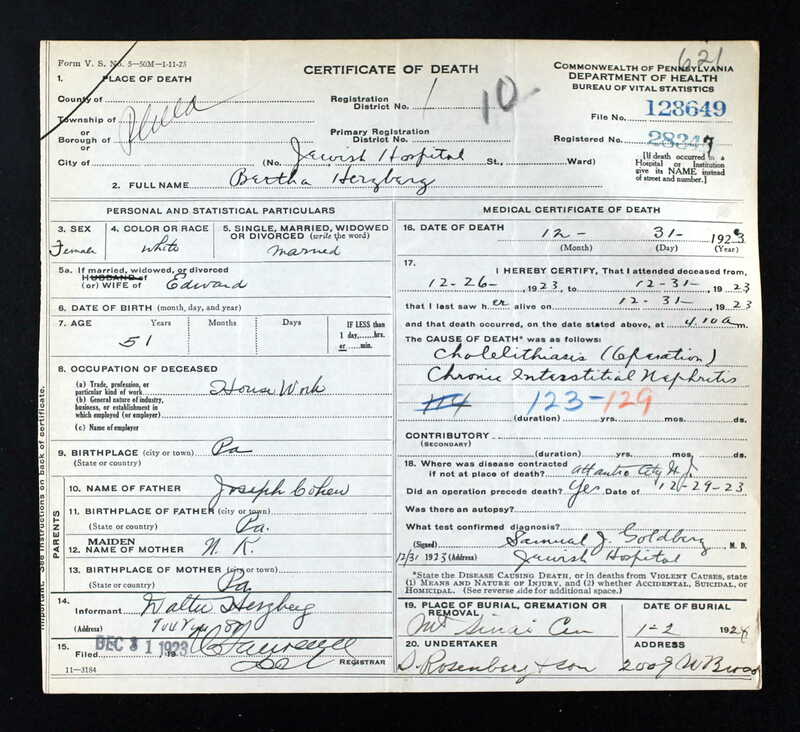 Her sister Hannah Durfor was the informant on her death certificate. She was buried at Arlington Cemetery in Drexel Hill, near Philadelphia. Fannie and Ansel’s youngest daughter, Caroline, is still one I need to research more deeply. Like her sister Bertha, she was still living at home as of 1910, also working as a saleswoman in a department store. I had a hard time tracking what happened to her thereafter, but found a marriage record for a Caroline Hamberg to a Robert Daley, dated 1926. She was then living with him in 1930 in Atlantic City. I do not know if this was the correct Caroline (there was another who married a Thomas Smyth, but her death certificate was inconsistent with Caroline’s background and family information). And I have not yet found anything else. Thus, as far as I know right now, Fannie and Ansel do not have any living descendants as I could not find any grandchildren for them. As for the children of Joseph Cohen and his wife Carrie Snellenburg, three of them predeceased their parents, as I discussed previously. Hart died of typhoid fever as a young child, Meyer died in infancy, and Morris died in 1919 when he was 31 during the Spanish flu epidemic. As for the seven who survived their parents, I had reasonably good success in tracking them, in large part because I found the article below about Joseph and Carrie’s 50th wedding anniversary celebration in 1919. The list of their children with their addresses and married names was a huge clue that helped me locate all but two of their surviving children and three of their grandchildren. First, their second child after Hart was Jacob. Jacob married Aida Goldberg in 1899 and was in the wholesale jewelry business. He and Aida had two children, Eleanor born in 1900 and Joseph born in 1902. I was able to get these two pictures of Adai courtesy of her grandson Jack. 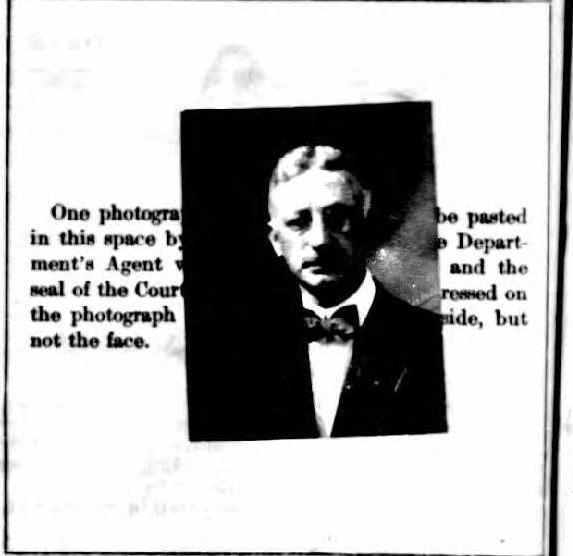 Jacob did some traveling to Europe for his diamond business, and fortunately I was able to find his passport application online which includes a picture and a physical description of him as of 1922. Jacob died on April 10, 1933, from nephrostatic (?) pneumonia and a cerebral something (?). (UPDATE: Fellow genealogy blogger Alex from Root to Tip says it is hypostatic pneumonia and cerebral hemorrhage. Thanks, Alex!) He was 62 years old, and it appears he had been under a doctor’s care for over a year and a half when he died. His occupation was given as a diamond broker. Jacob’s sister Bertha married Edward Herzberg in 1893. They had a daughter Pauline, who was born in 1894. Like his father-in-law and so many other Cohen relatives, Edward was a pawnbroker. Pauline was married to Philip Schultz (the Mr. and Mrs. Philip Schultz at the anniversary party) in 1917. Philip was also a pawnbroker. Sadly, Bertha died December 31, 1923, when she was 51 years old. She died after an operation for gall stones (cholelithiasis), but also suffered from kidney disease (chronic interstitial nephritis). The informant on the certificate was Walter Herzberg, who appears from other records to have been Edward’s brother. Edward remarried a woman named Hettie Kranzkopf. He died from heart disease on December 27, 1934. The story of the next sibling, Isaac, is a little more convoluted. Isaac married Lilian Katz sometime between 1900 and 1907, when their son Jac(k) or John was born. In 1910 they were living in Philadelphia, and Isaac was the proprietor of a “loan office,” or what I assume was a pawnshop. By 1920, the family situation had changed. Lilian and her son John were living in Pittsburgh with her parents, and her marital status was “divorced.” Isaac was living in Philadelphia with his sister and brother-in-law, Julia and William Raken, and he was now an automobile dealer. His marital status, however, was still given as married. Ten years later, it seems that Isaac and Lilian had reunited; Isaac was living in Pittsburgh with Lillian, John, and Lillian’s mother. He was now employed as a real estate agent. They both gave their marital status as married. I hope the reunion was a happy one, but it was not long-lived because two years later, on December 5, 1932, Isaac died from lobar pneumonia. He was living in Pittsburgh at the time of his death, and Lillian was his informant so they were still together at the time he died. Isaac was still employed as a real estate agent at the time of his death; he was 57 years old. Lilian was still living with her mother in Pittsburgh as of 1940, but I have not been able to find what happened to Lillian after that. Their son John married a woman named Ruth sometime before Isaac died, and they had one child born in 1931. Nathan, the next sibling, also had some marital troubles. He was single and living at home with his parents as of 1910 when he was 34 years old. He was working as a clerk in a “loan office,” presumably his father’s pawnshop. 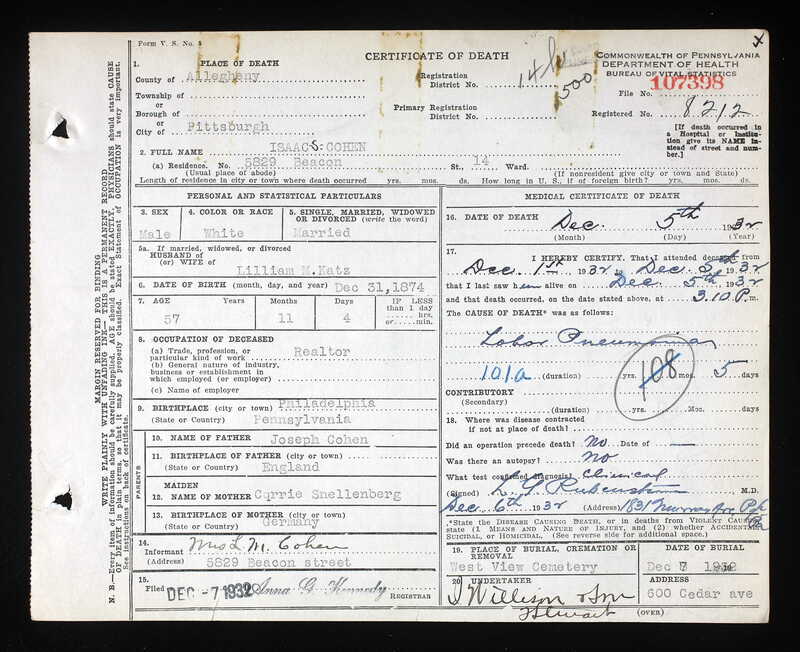 On his World War I draft registration, however, he was calling himself a self-employed jeweler and was still living at home with his parents. On Friday, July 4, 1919, the Philadelphia Inquirer ran an engagement announcement of Nathan Cohen and Sylvia Altman, and the marriage index also includes that couple. By 1920, however, Nathan is listed as divorced on the census and is once again living with his parents. Now he was working at a loan office again. Perhaps the jewelry business failed like the marriage. In 1925 Nathan married again; his new wife’s name was Nettie Strieff, and this marriage lasted at least ten years. Nettie was 14 years younger than Nathan; she was 40 and he was 54 at the time of the 1930 census. According to the census, Nathan had no occupation at that time. The last record I found of them was a 1935 ship manifest listing them as passengers on a ship sailing from Hamburg, Germany, to New York. I have not been able to locate them on the 1940 census, but I also have not found a death record for them. I guess I have to keep searching. That brings me to Sallie or Sallye Cohen, born in October, 1877. I was able to find Sallye’s married name through the 50th wedding anniversary story about her parents. By searching for Isaac Goldsmith, I was able to find a marriage record dated 1913 for Sallye Cohen and Isaac Goldsmith. Sallye was 36 when she married Isaac, and they apparently did not have any children. They lived in Allentown, Pennsylvania, where Isaac was first a real estate agent (1920) and later a real estate developer (1930). As of 1935, they had moved to South Whitehall, Lehigh, Pennsylvania, and in 1940 Isaac must have been retired as no occupation is given on the census. He and Sallye were 63 as of the date of the 1940 census. 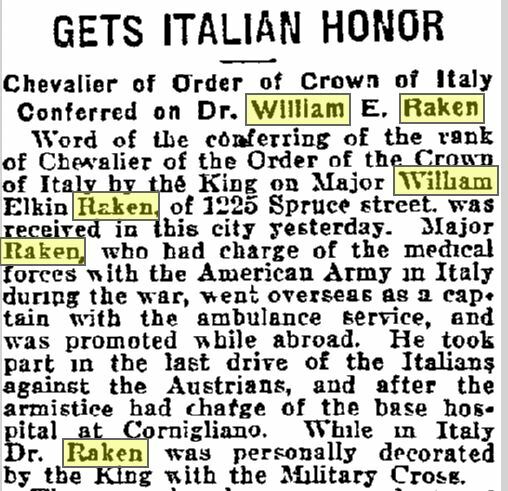 They are listed in the 1944 directory for Allentown, but I have not found any later records including any death certificates. My guess is that that means they lived past 1944, the last year that Pennsylvania death certificates are currently available. The child I have had the worst time locating is the next one, Fannie. Although she appeared on the census reports for 1900, 1910, and 1920, living with her parents, I cannot find her anywhere thereafter. I cannot find her on a census report, on the marriage index, or on any death records or burial records. She just disappeared. She is not even listed as one of the hosts of the 1919 50th anniversary party for her parents, yet she was living with them both before and afterwards. She was not working in either 1910 or 1920, even though she was 28 and 38, respectively, when those censuses were taken. It’s another gap I just cannot fill at this point. 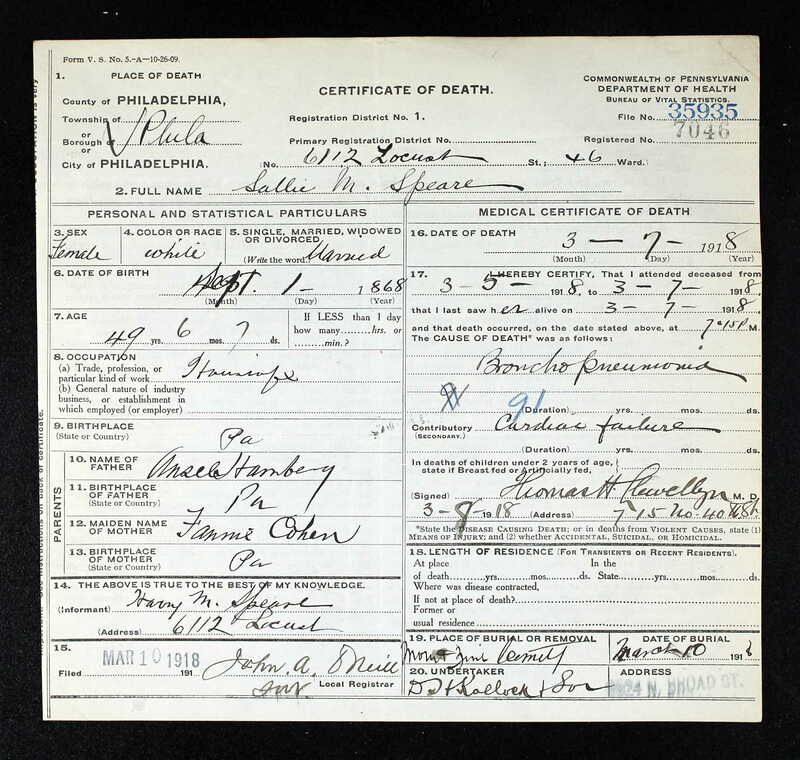 In 1920, Julia and William were living in Philadelphia with Isaac, Julia’s brother, as mentioned above. Sometime between 1920 and 1929, however, Julia and William were divorced; William died on February 1, 1929, from heart disease and diabetes. He was only 44 years old. 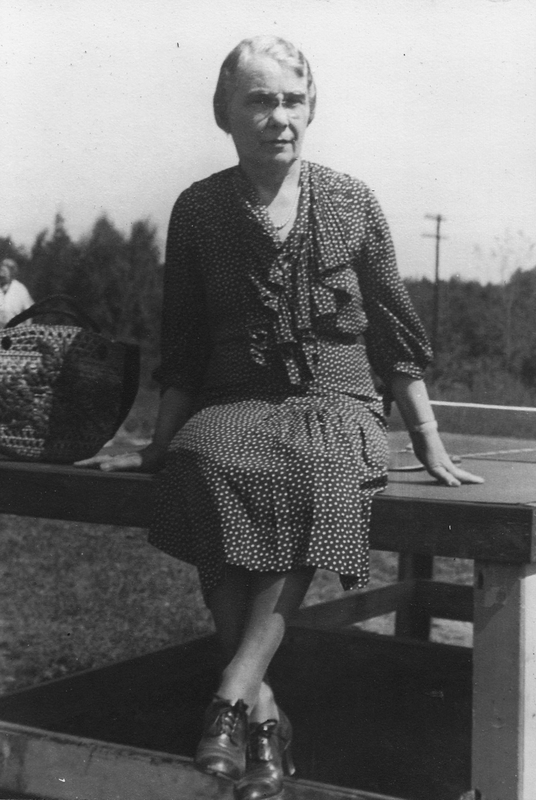 Julia apparently returned to her birth name, as she was buried as Julia Cohen in 1942 when she died at age 55. I could not find her death certificate, only her burial record, so I do not know her cause of death. 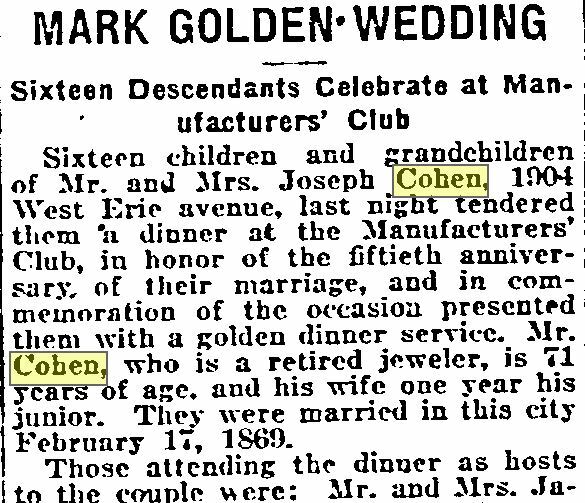 Finally, the last of the children of Joseph and Carrie Cohen to survive their parents was Samuel S. Cohen, the twin of Morris Cohen who had died in 1918 from influenza. Samuel’s story is fairly well-documented. He was born August 22, 1887 in Cape May, New Jersey. In 1910, he was still living at home and working as a salesman in a department store. In 1912 he married Tessie Wise. In 1914, their daughter Eva Carlyn was born. 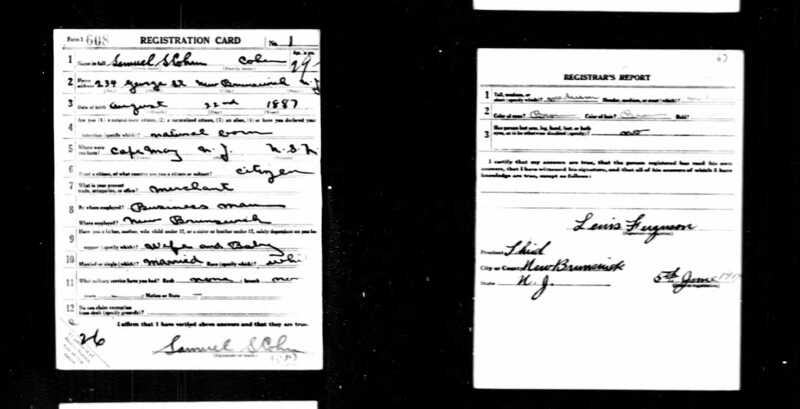 When Samuel registered for the draft in 1917, he, Tessie, and Eva were living in New Brunswick, New Jersey, where he was working as a merchant. On the 1920 census he was more specific and said he was a clothing merchant. The New Brunswick city directory for 1926 reveals that Samuel was then a manager for Snellenburg Clothes Shop in that city (Snellenburg being his mother’s birth name and probably his middle name). By 1940, they had moved to Highland Park, New Jersey, and Samuel was still in the clothing business. 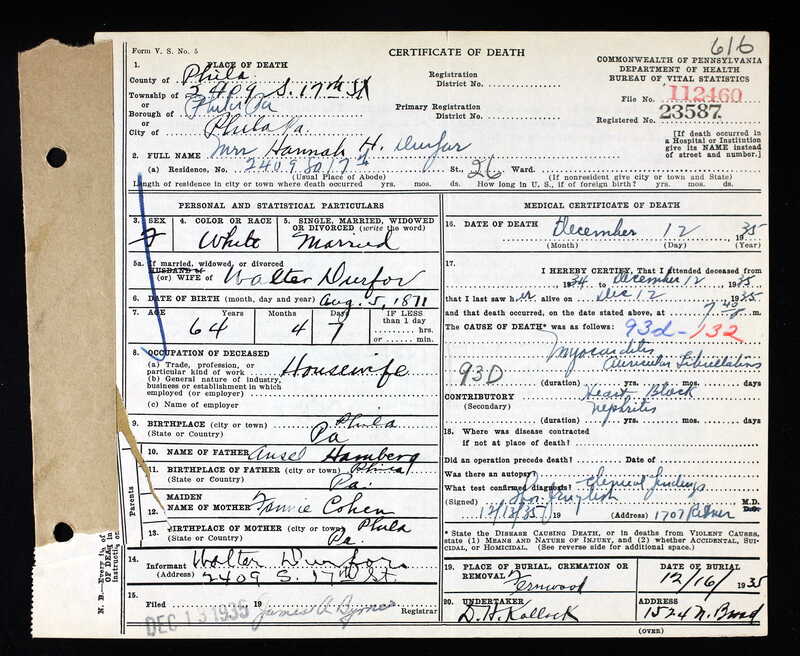 His World War II draft registration states that he was self-employed. The last record I have for Samuel is the 1944 New Brunswick, New Jersey, city directory, where he was still the manager of Snellenburg Clothing Shop in New Brunswick. In the 1946 directory, Tessie is now listed as a widow, and she is the manager of the store. Thus, Samuel must have died sometime between 1944 and 1946. He would have been less than sixty years old. Tessie would continue to run the store until at least 1969, when she was listed as the president of the Snellenburg Clothing business. She would have been 79 years old. She died February 14, 1973, when she was 83 years old. Tessie and Samuel were survived by their only child, Eva, who had married Abram Silverman. They had one child as well. Looking back on all these people, the children of Fannie and Ansel Hamberg and of Joseph and Carrie Cohen, all grandchildren of Jacob and Sarah Cohen, all first cousins of my own grandfather, I am struck by a number of things. First, very few of them lived to be sixty, and as far as I can tell based on my research thus far, none of them lived to be seventy. Almost all who were married were survived by their spouse. There were many who suffered from heart disease, diabetes, and/or kidney problems. Second, it seemed that unlike some of their siblings (Reuben, for example) or Joseph and Carrie or their grandparents Jacob and Sarah, these Cohen cousins had very few children collectively and not one of them had more than two children. They also tended to marry fairly late for those times, which obviously also contributed to the low birth rate. There were many childless marriages and more than a few only children. As far as I can tell, Fannie and Ansel Hamberg had no grandchildren despite having had five children. Joseph and his wife Carrie had five grandchildren, not as many as one would expect for a couple who had ten children. There are still a number of holes I could not fill in researching the children and grandchildren of Jacob and Sarah. As more records are made public over time, I am hopeful that eventually I will be able to fill them. 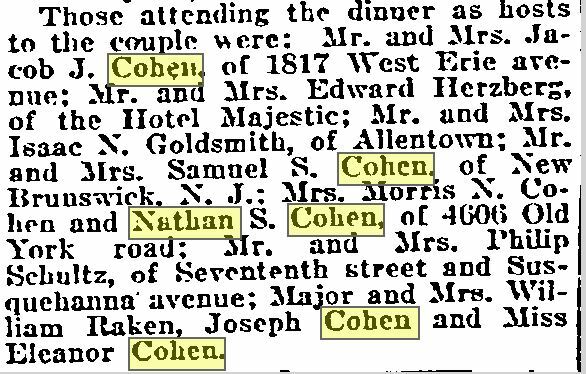 But for now, that completes my research and writing about the children and grandchildren of Jacob and Sarah Cohen, my great-great-grandparents. My next post will reflect on the bigger picture, the forest I have not seen while focused on the leaves on the trees. This entry was posted in Cohen, Genealogy, Philadelphia and tagged Cohen, Family, genealogy, Philadelphia by Amy. Bookmark the permalink. Enjoyed reading very much. Great research. Thanks! I appreciate your input very much. You have some great documentation here. Fascinating work, Amy. 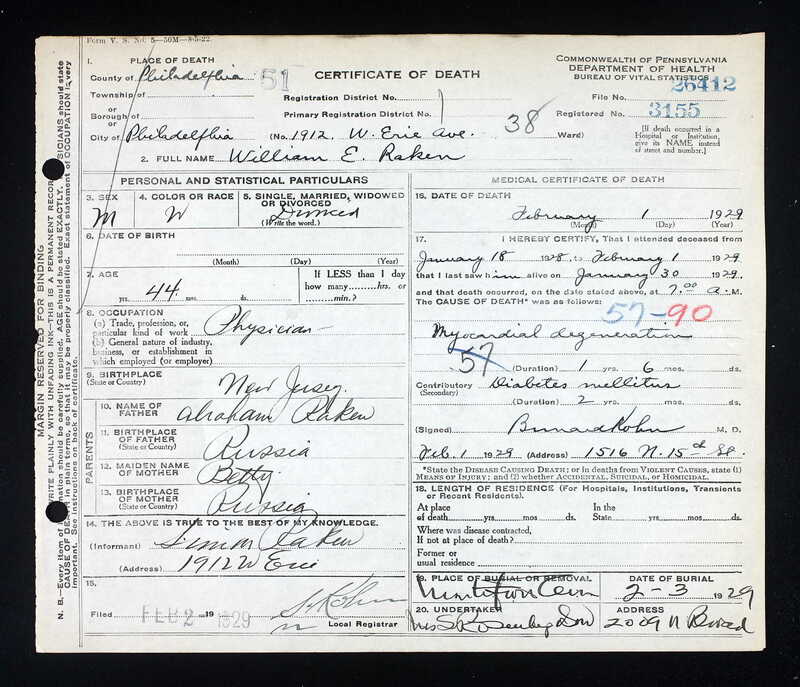 For a moment I was thinking how much the handwriting on the death certificates looks the same on your documents as mine in Illinois and Michigan, but then I thought Of Course! people used to learn the same handwriting style in those days. It’s only today that we have all these wildly different styles of writing. Very telling. And soon, I guess, we will have no handwriting at all. Yes, I remember every teacher had that perfect handwriting. Now I find I can barely write a sentence without leaving out a letter because I am not used to writing by hand. A lost art. I leave out letters, too!!! I thought it was just me. It’s actually very sad because it has a lot to do with personal communication. I think the days of the handwritten letter are done. I recently wrote a letter to a cousin who is 88, hoping the personal touch would appear to her. I have not yet heard back. Maybe she couldn’t read my writing! I have seen it—thanks. I couldn’t find any references to anyone with the Brotman name or anything similar. There are records that have not been indexed yet, so I am hoping that eventually there will be something helpful. Meanwhile, I wait. I am hoping to get to Poland next summer and find something there. Or hire someone before I go. Hi Amy – another great post as usual. It looks like the cause of death on Jacob J Cohen’s death certificate is Hypostatic Pneumonia and Cerebral Haemorrhage. Hope that helps! Thank you! You are amazing at deciphering handwriting!! I usually send these to my brother, figuring he will recognize medical terms that I would not know, but this time I didn’t want to bug him. 🙂 Glad to be able to help!